This wine pays tribute to the grape growing and winemaking predecessors that came before us in the Alexander Valley. Jim Rickards has taken cuttings from a number of Old Vine zinfandel blocks in the area, including the Pastori, Nervo, Vasconi, Mazzoni, Patchetti and Osborne vineyards. 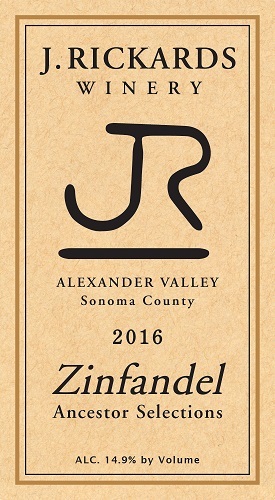 Additional fruit from several area vineyards was combined with our estate zin to create this classic blend. The grapes for our Ancestor Selections Zinfandel were all picked at the same time and co-fermented in the classic field-blend style of the early 1900s and then aged in French and American oak barrels for 21 months. Aromas of black cherry, licorice, and white pepper predominate. Well-structured on the palate, rich flavors of plum and boysenberry yield to an extended finish of toasty vanilla oak that perfectly rounds out this wine.